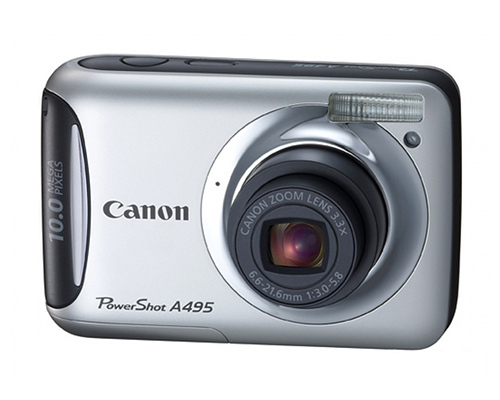 The Canon PowerShot A495 is an extremely inexpensive 10 megapixel point and shoot digicam. Given its low price point, the camera suffers from a split between photo quality and features, and the A495 leans towards the photo quality end of that spectrum. The camera measures 3.7" by 2.44" by 1.22" and weighs .3 lbs. It has an extremely small form and footprint, making it exceptionally portable and lightweight. The printer captures photos using a 1/2.3" type CCD with 10 million effective pixels, producing still images at resolutions of 320 by 240, 640 by 480, 1600 by 1200, 2272 by 1704, 2816 by 2112, 3648 by 2048, and 3648 by 2736. Video clips can be shot at 320 by 240 or 640 by 480 at rates of 30fps and can last up to 1 hour in length (or be sized up to 4GB). The camera produces files in JPEG (Exif v2.2), DPOF 1.1, and AVI (Motion JPEG) formats. The included lens is equivalent to that of a 35mm camera's, moving between 37 and 122mm and at fstops between 6.6 and 21.6mm. It includes a 3.3x optical zoom and a 4x digital zoom, and fstops between 3 and 5.8. Image stabilization is not an added feature. The camera includes a TTL focus. Auto focus area modes include 9-point face detection and a 1-point center auto focus. It offers a focus distance of 1 cm at its closest, an autofocus lock and an autofocus assist lamp. Metering can be evaluative (linked to the face detection autofocus), center-weighted, or spot (centered). The camera's ISO sensitivity can function automatically or at ratings of 80, 100, 200, 400, 800, or 1600. Exposure compensations moves between +/- 2 EV in 1/3 stop increments, and the camera has a shutter speed of between 1/2000 and 15 seconds. The camera includes automatic, program, special scene, and movie modes, as well as a number of scene modes: Portrait, Night Snapshot, Kids & Pets, Indoor, FaceSelf-Timer, Low Light, Super Vivid, Poster Effect, Beach, Foliage, Snow, Fireworks, Long Shutter. White balance options include automatic, Daylight, Cloudy, Tungsten, Fluorescent, Fluorescent H, and Custom settings. A self-timer set to 2 or 10 seconds is available. The camera can shoot .9 frames per second in continuous shooting mode and offers image parameters such as Colors Off, Vivid, Neutral, Sepia, Black and White, and Custom Color. The built-in flash is available with automatic settings, a manual flash on and off, slow synchronization, face detection, flash exposure lock, and a range between 30cm and 3m (W) and 2m (T). It can move as quickly as 1/2000 sec and can be added onto with an external HF-DC1 flash, the only available accessory. The camera includes a 2.5" TFT offering 115000 pixels at 100% coverage. It connects via USB and includes a PAL/NTSC switchable AV out, making it possible to connect the camera to external viewing devices in almost any part of the world. It will store images on SD, SDHC, SDXC, MMC, MMCplus, and HC MMCplus cards, and is powered by either 2 AA batteries or NiMH batteries (the camera includes two alkalines). A viewfinder is not built into this model. Some users complain of extremely long wait times between photos (upwards of 3 seconds with the flash), though this is fairly consistent with other AA-powered cameras. Furthermore, the LCD is not glare-resistant, making it sometimes extremely difficult to see in direct sunlight (complicated further by the lack of a viewfinder through which to scope image quality). AA batteries can produce a maximum of about 150 shots before requiring replacement. Using NiMH AA batteries, however, will likely produce over 300 before the batteries die. The camera's optical zoom cannot be used while shooting video. Very few accessories are available for the A495, as it is a point and shoot digicam. Canon sells the high-power flash, a deluxe soft case, battery packs, charger kits for the camera's batteries, AV cables, and AC adapters and little else.